The 2018 United States Senate election in Utah took place on November 6, 2018, to elect a member of the United States Senate to represent the State of Utah, concurrently with other elections to the United States Senate, elections to the United States House of Representatives, and various state and local elections. The primaries took place on June 26. Incumbent Republican senator Orrin Hatch announced in January 2018 that he would retire at the end of his current term and would not be seeking reelection. He was succeeded by Mitt Romney, who had been the Republican nominee for president in 2012 and previously was the 70th Governor of Massachusetts from 2003 to 2007, becoming only the third person in American history to be elected governor and senator in different states. At 71, Romney became the oldest person ever elected to the Senate as a freshman. Utah's 2018 U.S. Senate candidates have dual routes toward placement on the primary election ballot: (1) eligibility via win or second-place showings at a convention of delegates selected from party local caucuses; and/or (2) eligibility via obtaining sufficient petition signatures. Taking the traditional route, the top two candidates for the U.S. Senate at any of the party state conventions (to be held this year the latter part of April) will be placed on the June 26 primary election ballot. Also, any candidate who collects 28,000 ballot-access petition signatures will be placed on the primary ballot. If no competitor will have achieved the above-mentioned alternate access to the primary ballot through collected signatures and a convention winner had achieved sixty-percent of delegate votes, this candidate straightaway receives his or her party's nomination solely via the older-style caucuses-convention system. Otherwise, a candidate will be nominated through receiving a plurality of votes in the primary election and thereby advance to the November general election. Incumbent Orrin Hatch did not seek reelection. Incumbent Republican U.S. Senator Orrin Hatch was reelected to a seventh term in 2012. During his 2012 reelection campaign, Hatch had pledged that if he were elected that it would be his last term. Hatch won his first election in 1976 in part by criticizing the incumbent's 18-year tenure. Hatch initially announced a re-election campaign on March 9, 2017, though he also said at that time that he might withdraw from the race if Mitt Romney decided to run. An August 19–21, 2016, poll conducted by Public Policy Polling found only 19% of voters wanted Hatch to run in 2018, while 71% wanted him to retire. On October 27, 2017, Hatch reportedly told friends privately that he was going to retire in 2019 and on January 2, 2018, made a public announcement of his plans to retire at the end of his current term in January 2019. ^ The party affiliations of candidates were not described in the question wording as a result of an oversight by the pollster. ^ Wood, Benjamin (June 26, 2018). "Mitt Romney claims GOP nomination in Utah's U.S. Senate race". The Salt Lake Tribune. Retrieved June 26, 2018. ^ Mitt Romney Could Become Oldest Popularly Elected Freshman Senator. NY Mag. 7 April 2017. ^ a b Martin, Jonathan (January 2, 2018). "Orrin Hatch to Retire from Senate, Opening Path for Mitt Romney". The New York Times. Retrieved January 2, 2018. ^ Lederman, Josh (March 14, 2012). "Hatch will retire in 2018 if he wins reelection". The Hill. Retrieved October 20, 2016. ^ Romboy, Dennis (November 6, 2014). "Sen. Orrin Hatch leaves door ajar for run in 2018". Deseret News. Retrieved October 20, 2016. ^ Rolly, Paul (September 23, 2016). "When Hatch said he wouldn't run again, he was just kidding". The Salt Lake Tribune. Retrieved October 20, 2016. ^ Everett, Burgess; Palmer, Anna (October 19, 2016). "Hatch may reverse himself and run in 2018". Politico. Retrieved October 20, 2016. ^ a b Raju, Manu (March 9, 2017). "First on CNN: After lobbying from Trump, Orrin Hatch plans to run again". CNN. Retrieved March 11, 2017. ^ Prignano, Christina (March 31, 2017). "Utah Senator says he may forgo '18 run if Mitt Romney runs for his seat". The Boston Globe. Retrieved April 2, 2017. ^ Jensen, Tom (August 24, 2016). "Utah Ready for Hatch to Move On; More Progressive Than You Might Think". Public Policy Polling. Retrieved October 20, 2016. ^ Linskey, Annie (October 27, 2017). "A Hatch retirement — and a Romney Senate run — could be inching closer to reality". The Boston Globe. Retrieved January 2, 2018. ^ McKenzie Stauffer; Heidi Hatch (June 26, 2018). "Mitt Romney wins against Mike Kennedy, Rep. Curtis defeats Herrod for second time". KUTV.com. Retrieved July 15, 2018. ^ a b c d e Cathcart, Preston (March 14, 2018). "Candidates file for congressional, Utah legislative races". Deseret News. Retrieved March 15, 2018. ^ "Op-ed: It's time to invite Sen. Orrin Hatch to come home". DeseretNews.com. 2017-08-07. Retrieved 2017-08-22. ^ "Tooelean wants to capture U.S. Senate seat". Retrieved 2018-02-11. ^ "St. George attorney announces run for GOP US Senate nomination". StGeorgeUtah.com. January 6, 2018. Retrieved January 10, 2018. ^ Bowman, Bridget (April 28, 2017). "Rob Bishop Discounts Prospect of Senate Run". Roll Call. Retrieved April 30, 2017. ^ Viebeck, Elise (April 19, 2017). "Chaffetz will leave behind Oversight panel he used to investigate Obama White House". Washington Post. Retrieved April 19, 2017. ^ Samuels, Brett (20 November 2017). "Prominent conservative passes on Utah Senate bid". The Hill. ^ a b Rogin, Josh (November 8, 2016). "What is Evan McMullin's endgame?". The Washington Post. Retrieved November 11, 2016. ^ a b c "Mia Love on Twitter". ^ Burr, Thomas; Canham, Matt (November 16, 2016). "Sen. Orrin Hatch considers re-election run, Evan McMullin won't rule out his own bid". The Salt Lake Tribune. Retrieved December 4, 2016. ^ Weaver, Jennifer (April 16, 2018). "Ammon Bundy endorses Meyers for U.S. Senate citing his support of limited government". KUTV. Retrieved April 16, 2018. ^ Romboy, Dennis (April 6, 2018). "Former GOP gubernatorial candidate endorses Larry Myers for U.S. Senate". Deseret News. Retrieved April 7, 2018. ^ a b "Romney falls short in Utah GOP convention, forced into primary for Senate seat". ^ a b "Donald J. Trump on Twitter". ^ a b "Jeff Flake wants Mitt Romney to run for U.S. Senate in Utah". ^ a b "Lindsey Graham on Twitter". ^ a b "ChuckGrassley on Twitter". ^ CNN, Andrew Kaczynski,. "Sen. Orrin Hatch: Romney will 'have my support' if he runs for Senate". ^ a b "John McCain on Twitter". ^ a b "Mitch McConnell: "We're all behind" Mitt Romney". ^ a b "Romney, favored in Senate bid, could take on outsized role". 18 February 2018. ^ a b "Richard Shelby on Mitt Romney for U.S. Senate: 'I hope he will run - I would encourage him to run' - Yellowhammer News - Yellowhammer News". yellowhammernews.com. ^ a b "Jason Chaffetz Makes Comical Defense of Romney's Utah Senate Run: 'He's Got a Utah Driver's License'". www.mediaite.com. ^ a b "Paul Ryan on Twitter". ^ a b Beavers, Olivia (15 January 2018). "Jeb Bush backs Romney for Utah Senate run". ^ a b "Luis Fortuño on Twitter". ^ a b "Utah Gov. Herbert says Romney should run for the Senate". ^ a b "Spencer Cox on Twitter". ^ a b "Jon Huntsman Sr. backs Mitt Romney for Senate, says he'd represent Utah 'very, very well'". ^ a b McMullin, Evan. "Thank you for your service to our state and country, Senator Hatch. In this seat, we must have a leader prepared to meet the challenges of our day and our future. I hope that leader will be @MittRomney". ^ a b Milbank, Dana (29 December 2017). "Opinion - Run, Mitt, run" – via www.washingtonpost.com. ^ a b "Wall Street, big business start backing Mitt Romney's Senate bid as GOP establishment seeks stronger leadership in Congress". ^ a b c d "Romney for Senate". ^ a b "Tribune Editorial: Mitt Romney should be a savior for Republicans and run for Senate". ^ a b c d e f g h i j k l m n o "Endorsements | Mike Kennedy for US Senate". www.kennedyforutah.com. Retrieved 17 June 2018. ^ a b Romboy, Dennis (8 June 2018). "Not all lawmakers on candidate Mike Kennedy's endorsement list actually back him". DeseretNews.com. Retrieved 17 June 2018. ^ "Rep. Maloy endorses Mike Kennedy as US Senator from Utah". Representative A. Cory Maloy, Utah House District 6. Retrieved 17 June 2018. ^ "Larry Meyers on Twitter". Twitter. ^ Dr. Mike Kennedy. "ENDORSEMENT ALERT🚨Robert C. Oaks (Ret.) 4 Star General, USAF. Honorary Chairman for 2016 @realDonaldTrump campaign in Utah". Twitter. ^ "Michael Johns on Twitter". Twitter. ^ "Utah Election Preliminary Results". State of Utah. Retrieved July 12, 2018. ^ Burr, Thomas (July 17, 2017). "SL County Councilwoman Wilson launches 2018 Senate bid, hoping to take on Orrin Hatch". The Salt Lake Tribune. Retrieved July 17, 2017. ^ Witham, Joseph (May 22, 2017). "Mitchell Vice joins 2 other Democrats vying for Hatch's Senate seat in 2018". St. George News. Retrieved August 18, 2017. ^ Tribune, Courtney Tanner The Salt Lake. "Navajo candidate announces bid as Democrat for Hatch's seat". The Salt Lake Tribune. Retrieved 2017-05-17. ^ a b c Breiner, Andrew (June 21, 2017). "Navajo Candidate Drops Out of Race Against Hatch". Roll Call. Retrieved June 21, 2017. ^ Schott, Bryan (April 12, 2017). "Another Democrat looking to knock off Hatch in 2018". Utah Policy. Retrieved April 12, 2017. ^ a b c "Thank You". Danny Drew For U.S. Senate. Retrieved October 2, 2017. ^ "Salt Lake County Mayor Ben McAdams running for Congress | KSL.com". Retrieved 2017-10-19. ^ Meng, Grace. ". @JennyWilsonUT is fighting to bring honest, fair, and results-focused leadership to Utah, and I can't wait to watch her ride the #BlueWave2018 to victory in November!". ^ a b UT, Jenny Wilson for. "R or D, if we care about this country, we've got to work together and put people above party. Thank you, Chris!https://twitter.com/HollyMullen/status/911641841908334592 …". ^ a b Escamilla, Luz. "Excited for @UtahDemocrats Caucus at Rose Park Elementary and proud to be a surrogate for our next US Senator @JennyWilsonUT". ^ UT, Jenny Wilson for. "Thank you for your support, @IronStache! 2018 is going to be a great year". ^ "Mitchell Vice for United States Senate – Every American Thriving by Reinventing Politics". votevice.com. ^ Bernick, Bob. "Bishop Holds Vast Lead Over Clemens in Utah's 1st Congressional District". Utah Policy. ^ a b c d "2018 Candidate Filings - Lieutenant Governor's Office: Elections". elections.utah.gov. ^ Mike Kennedy [@KennedyForUtah] (27 June 2018). "As I told him last night, he will have my support and help" (Tweet) – via Twitter. ^ Merrill, Marc. "Honored to meet former Massachusetts Governor @mittromney A true inspirational leader and man of character, Mr. Romney embodies the servant leader mindset. He is deeply concerned about the growing tribalism and plight of the average American and is once again answering the call to serve. Need more leaders like him who are willing to do the right thing and put #countryoverparty #servantleadership". 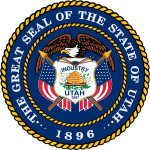 ^ "Carpenters 2018 Midterm Utah Endorsements | Southwest Regional Council of Carpenters". swcarpenters.org. ^ "Utah – Official UAW Endorsements". uawendorsements.org. United Automobile Workers. ^ "Utah AFL-CIO Election Endorsements". utahaflcio.org. ^ "Jenny Wilson – Feminist Majority PAC". feministmajoritypac.org. ^ "Utah Stonewall Democrats - 2018 Primary Election Endorsements". www.utahstonewalldems.org.